Der der de der der der….that’s the Countdown theme tune in case you didn’t recognise it. Time’s up. Wedding tomorrow and back to Pakistan on Sunday so no more plein-air for a while, I think I may have caught the bug though. 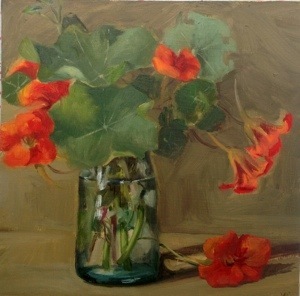 Anyway, a jar of nasturtiums took my fancy today and I was hoping for a last crack at those stooks this evening but the sun is definitely absent… We’ll see. I am taking a break from daily painting for the next month whilst I work on some bigger pieces but be assured I shall be painting on a daily basis and will keep you updated. Normal service will resume in September. Have a great August, the wicked month. Excuse the bad photo.